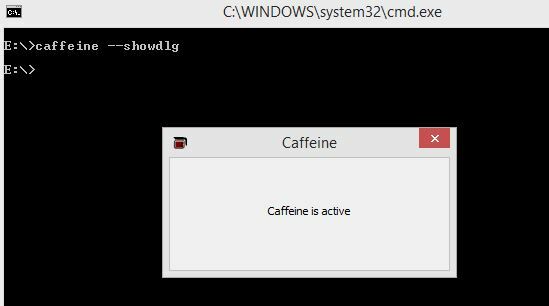 Caffeine is a lightweight freeware for Windows which prevents it from going to sleep mode, locking the screen or launch screensavers. This can be most useful when watching any audio or video presentation or movies uninterrupted. It does this by simulating a key press every 59 seconds thereby keeping Windows in an active state. Download and install Caffeine from here. Once installed, it will show up in the system tray. 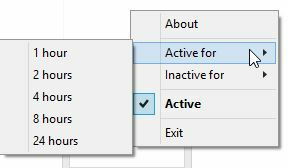 It can be disabled or enable for a specific amount of time by right clicking on it. Also it can be disabled/enabled by double clicking the icon. White empty icon means it is disabled (empty pot). Other than that, the command line parameters can do other useful things like setting a custom time delay, turn off the system tray icon and so on. A list of all these parameters can be found here.